Salty ham, crunchy celery, tangy pickles and creamy mayonnaise with a peppery bite from Tabasco. This spread is delicious on bread or crackers and perfect for a sandwich at lunch. Chunk the ham into cubes. Also rough chop the celery and onion. Add these ingredients to the food processor. Pulse until all ingredients are chopped. Drain the relish well. This will keep the spread from getting soggy. 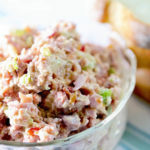 Remove the ham spread from the food processor and add remaining ingredients. Stir to combine. Spread on your favorite bread, crackers, cucumbers or celery. Refrigerate leftovers. Even better on day two!